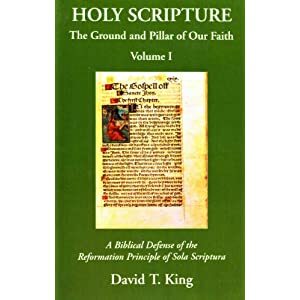 Pastor David King has been a friend of mine for some years now, and I know that many of us who know him think very highly of his work, ”Holy Scripture: the Ground and Pillar of our Faith”. Any reader of his Pastoral Letter to the separated Donatists on the Unity of the Church, must find it inexplicable, on the Jesuit theory, that in these seventy-five chapters there is not a single word on the necessity of communion with Rome as the centre of unity. Most of the Augustinian corpus has been translated, and New City Press is in the process of providing new translations of all of his works. But of all the works of Augustine that have been translated, there is one work, De Unitate Ecclesiae that has never been fully translated into English; and although New City Press plans to do so, it has been postponed for some five years now due (I’m told) to the prolonged illness of the translator. May the Lord be pleased to give him the health to finish. But in his controversy with the Donatists, Augustine wrote this work to refute their schism from the Church Catholic. Notice how Augustine does not lodge his argument in an appeal to apostolic succession in this particular work, in fact he bids his adversaries not to look in the direction of human testimonies. Over and over, he argues with the Donatists that the church is to be found in and defined by the Scriptures. Obviously, Augustine did not share the skeptical pessimism of our present day opponents with respect to the testimony of Holy Scripture. Of Augustine’s writings and this one in particular, Johann Joseph Ignaz von Döllinger observed: “St. Augustine has written more on the Church, its unity and authority, than all the other Fathers put together. Yet, from all his numerous works, filling ten folios, only one sentence, in one letter, can be quoted, where he says that the principality of the Apostolic Chair has always been in Rome,—which could, of course, be said then with equal truth of Antioch, Jerusalem and Alexandria. Any reader of his Pastoral Letter to the separated Donatists on the Unity of the Church, must find it inexplicable, on the Jesuit theory, that in these seventy-five chapters there is not a single word on the necessity of communion with Rome as the centre of unity. He urges all sorts of arguments to show that the Donatists are bound to return to the Church, but of the Papal Chair, as one of them, he knows nothing. See Janus, The Pope and the Council, trans. from the German, 2nd ed. (London: Rivingtons, 1869), pp. 88-89. I suppose, perhaps, that not many of my Reformed brethren have had the opportunity of reading the following list of citations from this particular work of Augustine, collated and organized in this manner, but where translations have been provided, I have arranged them in the following order in which they appear in this single work of Augustine. I think that when one can read them in this way, it gives something of a feel for the flow of this ancient African bishop’s argument. Bear in mind that this is how Augustine argued to call the Donatists back to the unity of the Church. And again, as Döllinger noted, never once does he posit that unity in the papal chair of Rome, or in its succession of bishops. There is an obvious difference in the modus operandi that Augustine employed in this work, and how our Roman disputants proceed with their contentions. Moreover, he does not ground his argument in the teaching authority of the church, but in Holy Scripture itself. Augustine (354-430): Let us not hear, You [i.e., the Donatists] say this, I say that; but let us hear Thus saith the Lord. There are the Dominical books, whose authority we both acknowledge, we both yield to, we both obey; there let us seek the Church, there let us discuss the question between us. For trans., see William Goode, The Divine Rule of Faith and Practice, 2nd ed., (London: John Henry Jackson, 1853), Vol. 3, p 164. Augustine (354-430): Therefore let those testimonies which we mutually bring against each other, from any other quarter than the divine canonical books, be put out of sight. For trans., see William Goode, The Divine Rule of Faith and Practice, 2nd ed., (London: John Henry Jackson, 1853), Vol. 3, p. 164. Augustine (354-430): I would not have the holy Church demonstrated by human testimonies, but by divine oracles. For trans., see William Goode, The Divine Rule of Faith and Practice, 2nd ed., (London: John Henry Jackson, 1853), Vol. 3, pp. 164-165. Augustine (354-430): Whoever dissents from the sacred Scriptures, even if they are found in all places in which the church is designated, are not the church. For trans., See Francis Turretin, Institutes of Elenctic Theology, 3 Vols., trans. George Musgrave Giger and ed. James T. Dennison (Phillipsburg: reprinted by Presbyterian and Reformed Publishing Co., 1992), Vol. 3, pp. 109-110. Augustine (354-430): We adhere to this Church; against those divine declarations we admit no human cavils. For trans., see William Goode, The Divine Rule of Faith and Practice, 2nd ed., (London: John Henry Jackson, 1853), Vol. 3, p. 165. Augustine (354-430): I have the most manifest voice of my pastor commending to me, and without any hesitation setting forth the church, I will impute it to myself, if I shall wish to be seduced by the words of men and to wander from his flock, which is the church itself, since he specially admonished me saying, “My sheep hear my voice and follow me”; listen to his voice clear and open and heard; who does not follow, how will he dare to call himself his sheep? Let no one say to me, What hath Donatus said, what hath Parmenian said, or Pontius, or any of them. For we must not allow even Catholic bishops, if at any time, perchance, they are in error, to hold any opinion contrary to the Canonical Scriptures of God. Francis Turretin, Institutes of Elenctic Theology, trans. George Musgrave Giger, ed. James T. Dennison, Jr., (Phillipsburg: P&R Publishing, 1992),Vol. 3, pp. 91-92 and William Goode, The Divine Rule of Faith and Practice, 2nd ed., (London: John Henry Jackson, 1853), Vol. 3, p. 165. Augustine (354-430): All such matters, therefore, being put out of sight, let them show their Church, if they can; not in the discourses and reports of Africans, not in the councils of their own bishops, not in the writings of any controversialists, not in fallacious signs and miracles, for even against these we are rendered by the word of the Lord prepared and cautious, but in the ordinances of the Law, in the predictions of the Prophets, in the songs of the Psalms, in the words of the very Shepherd himself, in the preachings and labours of the Evangelists, that is, in all the canonical authorities of sacred books. Nor so as to collect together and rehearse those things that are spoken obscurely, or ambiguously, or figuratively, such as each can interpret as he likes, according to his own views. For such testimonies cannot be rightly understood and expounded, unless those things that are most clearly spoken are first held by a firm faith. For trans., see William Goode, The Divine Rule of Faith and Practice, 2nd ed., (London: John Henry Jackson, 1853), Vol. 3, p. 165. Augustine (354-430): We ought to find the Church, as the Head of the Church, in the Holy Canonical Scriptures, not to inquire for it in the various reports, and opinions, and deeds, and words, and visions of men. For trans., see William Goode, The Divine Rule of Faith and Practice, 2nd ed., (London: John Henry Jackson, 1853), Vol. 3, p. 165. Augustine (354-430): For we do not say that we ought to be believed because we are in the Church of Christ, or because that Church to which we belong, was commended to us by Optatus, Ambrose, or other innumerable Bishops of our communion; or because miracles are everywhere wrought in it. . . . These things are indeed to be approved, because they are done in the Catholic Church, but it is not thence proved to be the Catholic Church, because such things are done in it. Our Lord Jesus Christ Himself, when He rose from the dead, and offered His body to be touched as well as seen by His disciples, lest there should be any fallacy in it, thought it proper to convince them, rather by the testimony of the Law, the Prophets, and the Psalms, showing how all things were fulfilled which had been foretold; and so He commanded His Church, saying, that repentance and remission of sins should be preached in His Name, among all nations, beginning at Jerusalem. This He testified was written in the Law, the Prophets, and the Psalms; this we hold, as commended from His mouth. These are the documents, these the foundations, these the strong grounds of our cause. We read in the Acts of the Apostles (Acts 17:11), of some believers, that they daily searched the Scriptures if these things were so. What Scriptures? but the canonical books of the Law and the Prophets; to which are added the Gospels, the Apostolical Epistles, the Acts of the Apostles, and the Revelation of St. John, Search, then, all these, and bring forth something manifest, by which you may prove the Church to have remained only in Africa, or come out of Africa in order that it might be fulfilled which the Lord said, “And this gospel of the kingdom will be preached in all the world as a witness to all the nations, and then the end will come.” For translation, see Charles Hastings Collette, Saint Augustine: A Sketch of His Life and Writings, A.D. 387-430 (London: W. H. Allen & Co., 1883), pp. 48-49. I saw this earlier today and it was fantastic. Thanks for putting it up here at Beggars All. Thanks Mark. I've fixed the links. I'm sure some Catholic will be by and throw in a "Nuh-uh" or a "Well, what about this?"